The Direnni Acropolis (formerly known as Tyrigel)[verification needed — different places?] is the ancestral holdings of the Direnni, found in the eastern valley of Eton Nir, northeast of the city-state of Cloudrest. The Direnni are an influential family of High Elves known for their expertise as merchants and their influence in the province of High Rock. When the Direnni Clan moved to the Isle of Balfiera, the family had eventually severed all ties with the stronghold and it soon became the source of legends. When it was merely the farming village, Tyrigel, it was the home of Asliel Direnni and the early Direnni, who were but humble farmers that worked together. Asliel was a talented, self-taught alchemist, being referred to as the founder of Alchemy. Eventually, Tyrigel was targeted by the Locvar Tribe, who were moving down the Caomus River and stumbled onto Tyrigel, seeing it as a good target for food and other bounties. After various raids on the village, Asliel developed an invisible potion that would turn all of the Direnni invisible, and when the Locvar would raid Tyrigel, they would be forced back by the invisible Altmer. Eventually, the Locvar had captured Asliel, who would trick the chieftain, by having him drink poison. This led to the fall of the Locvar and the Direnni where saved for good. Asliel was even invented to join the Psijic Order. 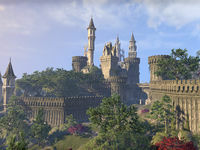 As time went on, the Direnni Clan had become an influential family on the Summerset Isles, establishing the foundation for the Direnni Acropolis. When the time came when the Direnni relocated to the Isle of Balfiera, some of the Direnni family remained in the Acropolis, but they would in time also leave the fortress. Some time in the First Era, a young member of the Direnni Clan, Lauriel, had become proficient in the arts of Necromancy, much to the dismay and horror of her Clan. Her sister, Selenwe had pleaded her to stop it, but Lauriel was adamant and became a threat to the Direnni. To prevent anything else from happening, she was buried alive in a sarcophagus and bound by twin flames guarded by a Keeper. As time went on, the Direnni in the Acropolis had relocated, either spreading across the Summerset Isles or to the Isle of Balfiera, and eventually the last Keeper of the Acropolis lay dead; Lauriel—who remained dormant within the catacombs—was forgotten. Eventually, Lauriel was able to manifest as a Ghost, haunting the Direnni Acropolis and waiting for a passerby who can free her from her prison. The Direnni Acropolis soon became the source of various legends and ghost stories, because of the foreboding and ominous atmosphere that Lauriel has placed in the area. Sometime around 2E 583, the curse that haunted the Direnni Acropolis was lifted when members of the Divine Prosecution and a newcomer arrived to the area. It is unknown whether Lauriel was released or properly sealed away. ^ Events of "Lauriel's Lament"
This page was last modified on 21 October 2018, at 08:24.